We believe that fetal positions are not random, that babies fit the space available. Yet, thinking of the size of the baby or the pelvis is not enough. Birth anatomy can be flexible. Both the uterus and the pelvis have more available room when the muscles and other soft tissues are balanced. Gail Tully offers a new approach with an anatomical basis. Spinning Babies uniqueness is in our perspective, allowing you to see birth through a new lens. 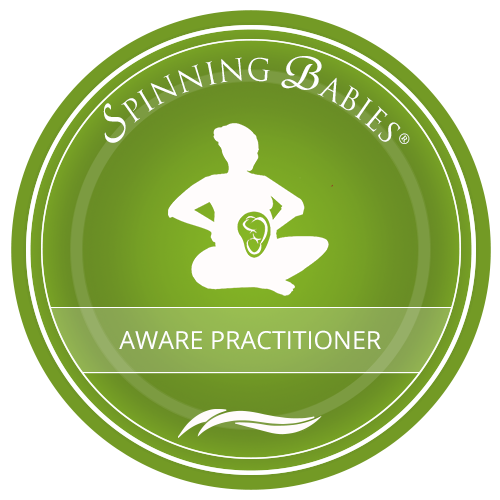 When a person learns a technique for the first time at a Spinning Babies® Workshop, they may tend to say they “did Spinning Babies.” However, Spinning Babies is the vantage point to see what is helpful. Baby’s position can teach us about the alignment of the birthing persons womb and pelvis and can be an impetus to direct us in our preparation. Moving the question of “How far dilated?” to a less prominent status, we reduce force-based efforts and awaken physiological solutions. By turning our attention to the baby, we open minds to support physiological birth, reduce fear, and improve parent bonding and baby attachment.